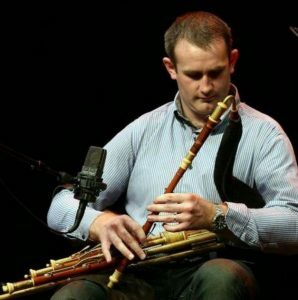 Coiste Scoil Acla has today announced Co. Leitrim’s Padraig McGovern as the Musician in Residence for Scoil Samhraidh Scoil Acla 2018. Padraig hails from Ballymagovern, a townland in the Cavan-Leitrim border area. His music reflects this placement with influences of both counties evident. He was taught by master piper P.J. Flood from Belturbet, Co. Cavan and heavily influenced by the Button accordionist Vincent Tighe. His family were all involved with the Cornafean Céilí group and were regular session artists in the Shamrock Bar in Killeshandra. In conjunction with this, he developed his music as a member of the Ceolas Céili Band under the tutorship of Fr. John Quinn (P.P. Gortletteragh) and session playing with many renowned Leitrim musicians at festivals all over the county. It is through the tutorship of Fr. Quinn that Padraig has inherited a rich repertoire of music resurrected from the manuscripts of Stephen Grier and Alex Sutherland. A highly regarded tutor of the Uilleann Pipes, Padraig has toured extensively and released a number of CDs including Forgotten Gems with Peter Carberry in 2013. His 2015 multi-disciplinary project The Pipes The Pipes produced by Donal Dineen with pipers Leonard Barry and Maitiú Ó Casaide and visual artists Guillermo Carrion and Lionel Palun has received much critical acclaim. “2018 is the Year of the Pipes and to have somebody of the calibre of Padraig join us for our summer school as Musician in Residence is fantastic, we really hope the pipers in attendance learn as much as possible from him during the course of the week. “Thankfully Scoil Acla continues to grow at pace and offers a varied range of traditional music classes, workshops, concerts and recitals for all ages and abilities. We look forward to welcoming back our regular tutors and students as well as new faces this July.” said Cathaoirleach of Scoil Acla, Sarah Calvey. The Scoil Acla Musician in Residence programme allows students to meet professional musicians in an informal setting to discuss all aspects of being a traditional musician (the current context of the music) and its role and function within our wider lifestyle. The aim is to illustrate and bring awareness to the students of the wider context of the music which is being taught in class. This exposure reinforces and consolidates students’ interest in music. It encourages and compliments their interest, and in the longer term gives them confidence in pursuing their interest in their particular instrument. Past musicians who have taken up residency for Scoil Acla Summer School include John E. Lavelle, Joe Burke, John Carty, Liam O’Connor, Mary Bergin, Laoise Kelly, Catherine McEvoy, Micheál Ó’Raghallaigh, Mick O’Brien, Treasa Ní Cheannabháin, Breanndán Ó Beaglaoich, Eileen O’Brien, Kieran Hanrahan, Noreen O’Sullivan, Paul Dooley and Edel Fox many of whom have joined Scoil Acla as tutors over the years. Scoil Acla Summer School 2018 runs from July 28th to August 4th and online bookings are now open. For more information please visit www.scoilacla.ie, email info@scoilacla.ie or phone us on 085 881 9548.